French airline Aigle Azur is to expand its presence in the Russian and Ukrainian markets with two new routes connecting Marseilles with Moscow and Paris with Kyiv in the coming IATA Summer season, whilst also increasing the frequency on its Paris to Moscow route and extending a code-share agreement with its Russian partner. The thrice-weekly services between Paris Orly and Kyiv Boryspil are the French airline’s first exposure to the Ukrainian air travel market, with flights to the Ukrainian capital to be operated by a 180-seat Airbus A320 starting from April 18. Currently, it is the flag carriers of France and Ukraine – Air France and Ukraine International Airlines – which serve the Paris-Kyiv route, with both of them operating to Paris’ Charles de Gaulle airport. Meanwhile, France’s second biggest carrier will begin its twice-weekly A320 flights between Marseilles’ Provence airport and Moscow’s Domodedovo airport on March 27. “It was logical for us to offer our customers living in the south of France a new option to visit the Russian capital: an urban and business hub with high economic and tourism potential, and also to allow travellers to benefit from significant flexibility,” explains Tiago Martins, Aigle Azur’s sales and marketing director. 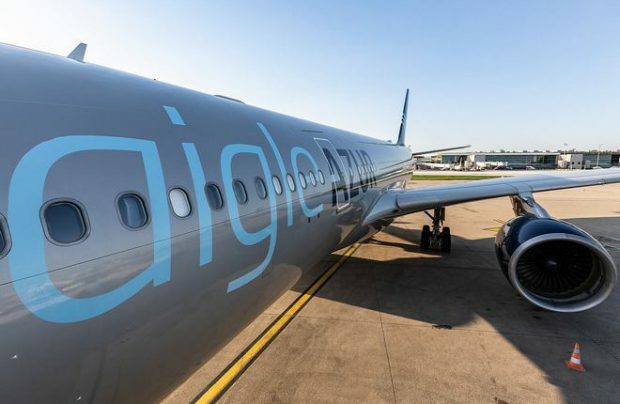 Earlier this month, a year after the launch of its Paris Orly to Moscow Domodedovo A320 service, Aigle Azur announced the addition of two new frequencies on the route. Served until recently by only two flights per week, the Russian capital will now be accessible four times weekly from the airline’s Orly base. Aigle Azur was appointed as the second designated carrier (after French flag carrier Air France) by Russian aviation authorities in 2018. Between 2012 and 2014, and also for a period of time in 2017, the airline provided services to Moscow’s Vnukovo airport and later Domodedovo, code-sharing with the now defunct Russian airline Transaero. A programme was eventually suspended. Reportedly, at that time, Aigle Azur’s designated-carrier status was granted on a temporary basis. Since August 2018, Aigle Azur has been operating codeshare flights between Paris and Moscow with S7 Airlines (Sibir). With its large network of domestic destinations flying from Moscow, the second biggest Russian airline gives Aigle Azur’s passengers a range of connections. Soon, nine more destinations will be added to this codeshare agreement, Aigle Azur reveals. Aigle Azur’s shareholders are the Chinese conglomerate HNA (48 per cent); the founder of JetBlue Airlines and Azul, David Neeleman (32 per cent), and Lu Azur (20).